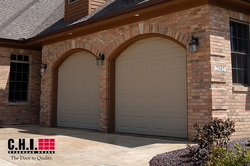 We carry quality CHI manufactured garage doors at great prices. When you call for a new door estimate in West University Place , TX we will never quote you a price on cheap, low quality, or thin doors. We believe that it is worth the few extra dollars to have a higher end door that will last longer, perform better, and require less maintenance. Shown here is a CHI Accent Woodtones door in mahogany color. This door has the beauty of a wooden door, but the durability and low maintenance of steel. We also specialize in decorative carriage house garage doors for added appeal to the face of your home.